Dynamic Integration of CAS and DGS: what does this mean? While we are seeing a growing range of software options which offer both computer algebra systems (CAS) and interactive or dynamic geometry systems (DGS) within the one envelope, in most cases these appear not to offer a "true" integration of these two environments: rather, the systems exist alongside each other with some nominal interaction. 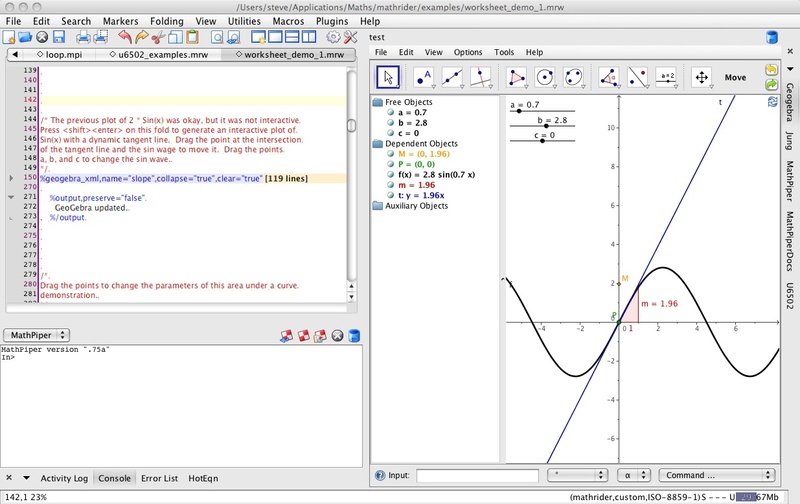 This session considers some examples of integration currently available, including GeoGebra, TI-Nspire CAS, Geometry Expressions and the new MathRider. It explores applications of such integration to the teaching and learning of mathematics, particularly at high school level, and finally poses questions regarding the possibilities for future development towards true dynamic integration between CAS and DGS. I think Jere Confrey, now of North Carolina State University, said it best many years ago: Mathematics has always been a tool-based activity. As the technology has progressed, so have the tools become more powerful and, thankfully, more appropriate, especially regarding their use in teaching and learning. We now have the opportunity for our students to have access to the same type of tools that are being used by working mathematicians, but presented in a way that makes them ideally suited for classroom use. Computer algebra systems (CAS) offer a prime example of a working tool which have become increasingly appropriate (in at least some incarnations) for use in schools. The primary uses of mathematics technology have ever been distributed between the twin purposes of manipulation and representation. In their early forms, mathematical tools tended to serve one purpose or the other: so a scientific calculator or a spreadsheet served primarily as manipulative tools, with little representational value. The graph plotter, on the other hand, originally allowed for little manipulation of its subject: it was first and foremost a tool for visualisation. Increasingly, however, we have seen the appearance of technological tools which offer substantial benefits across both domains of purpose: dynamic geometry software was always an example of a software type which spanned both representational and manipulative functionality. Undoubtedly a representational tool, this software allowed these representations to be manipulated and acted upon in a deliberate and mathematical way. Tools like GeoGebra now offer a true integration of graphing and geometry environments: graphical objects may be manipulated and acted upon using geometric tools. There even exists a dynamic interaction between the graph and its symbolic form: as the graph is moved and changed, its algebraic form updates in real time and students readily build deep understanding of the relationship between the graphical and algebraic forms. What remains elusive, however, is what I would consider true integration of the symbolic form (as embodied in computer algebra software) and the geometric environment of dynamic geometry software (DGS). I am interested to explore the idea of a true conversation, a dynamic dialogue between these two powerful mathematical worlds. In this discussion, I will consider a few examples of software currently available, both free and commercial, which may be seen to address this issue, with varying degrees of success. First, however, it is worthwhile addressing two key questions: what might such a conversation actually look like, and what value might such integration provide, especially in a teaching and learning context? Many conversations tend to be a bit one-sided, dominated by the interests of one or other of the participants. Here, too, we will see the same tendency: where these distinct and powerful tools do co-exist, in most cases, one side or the other dominates. There are computer algebra packages which have some geometric capabilities, such as xCAS, but there is little interplay between the two. They simply live within the same envelope. Powerful tools such as Mathematica do have some geometric capabilities, but these tend to be contrived and limited, not at all justifying any claim to offering a true dynamic geometry environment. 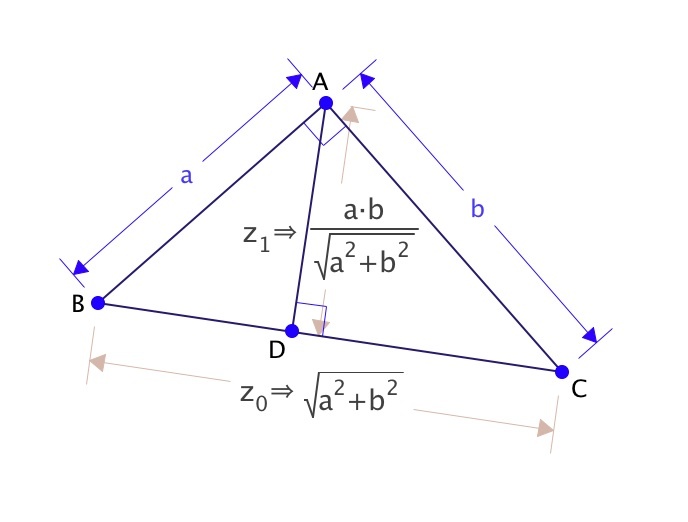 Similarly, some geometry packages do boast some CAS capabilities (GeoGebra is an example). However, the environment remains graphic/geometric, with no dedicated CAS window which might support extended manipulation of symbolic forms. It is useful at this point to be clear concerning what we might consider a computer algebra environment. While most modern CAS are truly multi-representational, in this context we need to focus upon the symbolic manipulation functionality: the ability to manipulate symbolic objects in a coherent and, in some cases, extended way. Similarly, while the integrated graphing and geometry package is becoming increasingly popular, for our purposes here we need to focus upon the dynamic geometry capabilties of such tools: the construction and manipulation of geometric objects which are dynamic and interactive. So what we seek here is a situation in which action upon a geometric object will be reflected in change to a symbolic form, and in the same way, manipulation of an algebraic form is reflected in a geometric (NOT just a graphical) sense. And the value of such an environment? The visual nature of geometry makes it readily accessible to learners of all ages, especially when enhanced by dynamic interactivity. Results and relationships that are difficult to appreciate on a static page spring to life when engaged with in an interactive way. Models may be built geometrically to provide live illustration of algebraic relationships. Students see and physically change the value of a variable and experience the effect of this change upon both geometric and algebraic forms. Algebraic understanding, however, remains elusive. Few people are like the great Leonhard Euler of whom it was said that he could "calculate as the eagle soars" - even in his great old age, completely blind, Euler was able to perform prodigious feats of mathematics completely in his head! For most of us, we require visual support for our mathematical enquiry and activity, and much of algebra can be traced to a geometric basis. The importance of the graphical representation for learning is now well appreciated; in the same way, symbolic forms that can be expressed geometrically offer great potential for increased student understanding and retention. 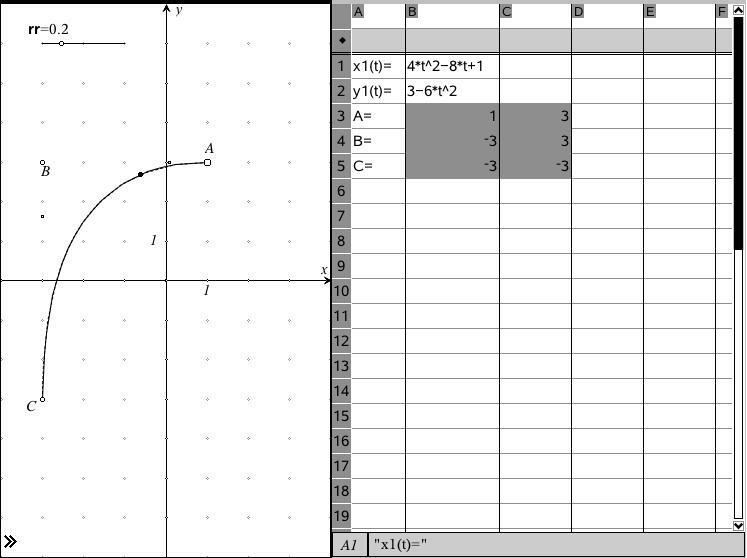 The ability of tools (such as GeoGebra and TI-Nspire) to support a truly dynamic integration of graphic and algebraic forms offers much for improvements in learning of mathematics; in the same way, a true integration of algebraic and geometric environments offers similar, and perhaps even greater, potential. In the examples which follow you will find a common thread: one of my favorite explorations: the development of bezier curves by both geometric and algebraic means. Bezier Curves (or splines) are used to create the curves we see on pages and computer screens - the basis for many of the font faces we use. Geometrically, they may be constructed by use of dilations or proportional points along a pair of segments joined at a common point. Algebraically, their parametric form results from a neat application of a recursive definition - an online example is available for those who would learn more. So what tools may we choose from in this regard? 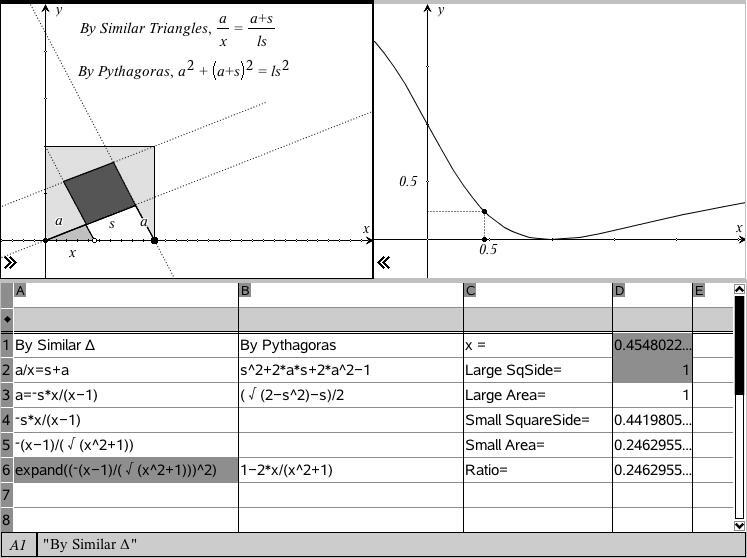 Without doubt, GeoGebra is a remarkable and powerful software tool for mathematics teaching and learning. The name itself suggests an integration of GEOmetry and alGEBRA, and to some extent it achieves this integration in supporting the geometric definition of variables which can act upon both graphical and geometric contexts. In the next release, the software includes some CAS capabilities - polynomials can be factored, expanded and simplified using the YACAS engine. But always this is within the graphical context, since there is no dedicated window or environment in which algebraic expressions can be acted upon symbolically. Markus Hohenwater, creater of GeoGebra, is quite explicit about its bi-directional capabilities, supporting free interaction between algebraic and graphical forms (Hohenwarter, M and Preiner, J, 2004). In fact, he refers to establishment of such a link between computer algebra and dynamic geometry as a core premise of his work on GeoGebra from the beginning. GeoGebra is a great example of an algebraic/graphical conversation but one which in reality offers limited dialogue between the algebraic and geometric. Certainly, the product continues to improve and we might expect that this will change over time, but without a dedicated symbolic environment, the CAS capabilities are token. Perhaps more interesting in this context is a relatively new project undertaken by Ted Kosan from the US in which he attempts a more or less unified interface between a number of free and open source mathematical tools - including the computer algebra system Yacas and GeoGebra. Not just fellow travellers but offering a much more viable and interactive relationship than we have seen elsewhere. What is offered here are multiple windows, each serving a different application: the scripting window in the top left of the screen accepts commands within what are called "folds" - the Yacas implementation here is rebadged "MathPiper" and a fold begins with a delimiter such as "%/mathpiper" followed by commands. In the example shown, we begin by using MathRider to talk directly to GeoGebra, using GeoGebra syntax and commands (this uses a fold which begins with "%geogebra"). We define the x and y coordinates for three points, which are then created. 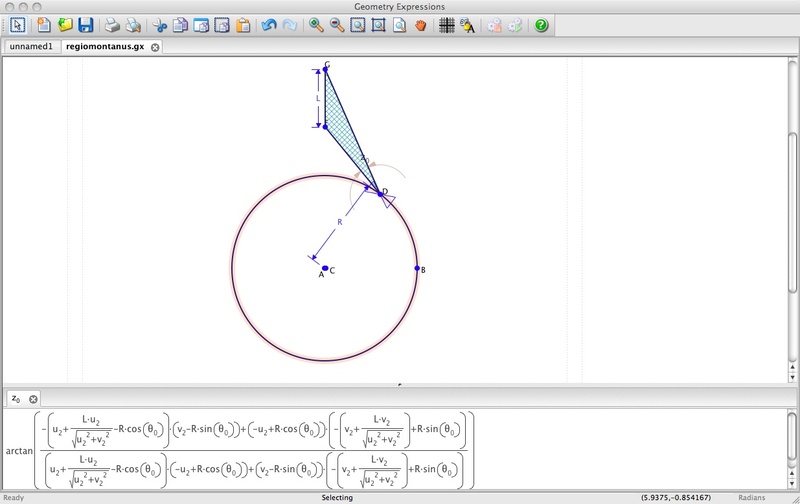 Using dilation, the bezier curve is then defined geometrically - all from within the MathRider window. Now we move to the CAS component of MathRider ("MathPiper"). First, we define a bezier function (bez1(a,b,r) = a*(1-r)+b*r) which takes three inputs - a start and end value and a ratio value. GeoGebra is quite limited in this regard, only supporting functions of a single variable, which has to be "x", so the ability to define a broader range of functions considerably extends GeoGebra's capabilities. Then a recursive definition supplies us with the second-order bezier function (bez2(a,b,c,r)) which takes three inputs and the ratio variable. Using the x-coordinates defined geometrically already, we then define and plot two quadratic functions - one will serve as the x-function and the second as the y-function for a parametric definition of our bezier curve. All this is done algebraically within the CAS. Finally, return to GeoGebra mode and, using the components defined above, we plot the parametric function using GeoGebra's "curve" command. This gives a nice fit to our original 3 points, and is in fact, dynamic - drag the points around and the curve follows. 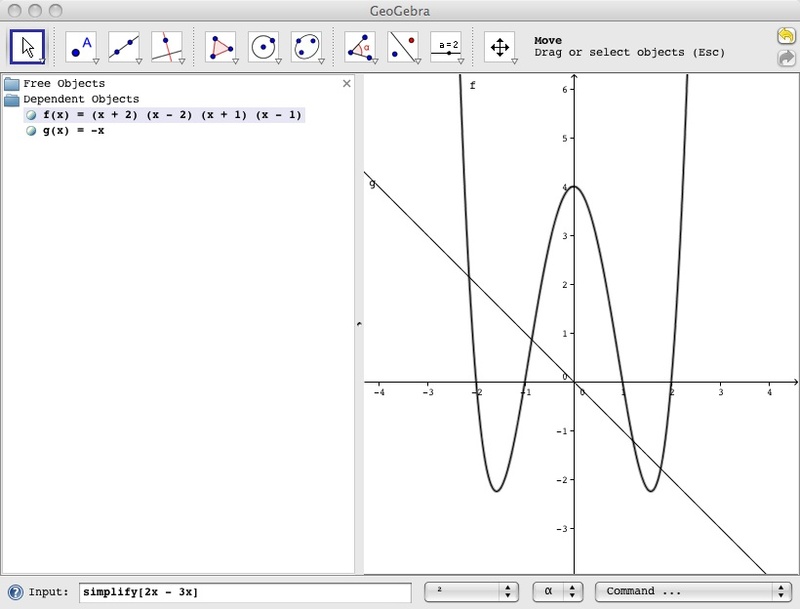 We can even use GeoGebra's conic by 5 points command to map the conic (implicit) form to this curve. What we lack here is the ability to transfer information back from GeoGebra to MathRider, so I cannot at this point grab that implicit form and work with it, other than by copy and paste. So we have a one-way communication, just as we have within GeoGebra itself when a function is defined in the Input line. For the willing, however, the rewards can be great. The geometric constructions available within GeoGebra can be scripted, and here is where the potential for a true CAS embodiment begins to emerge. The interface is challenging for anyone but the most capable of school students. The scripting and command-line interface requirements are daunting, too much so for busy teachers to take the time required. And at this stage we are not seeing that equal two-way conversation that we desire. But here we are presented with a taste of what might be - closer to an equal conversation, a truer integration of CAS and DGS. If we wish to experience a true integration of computer algebra and dynamic geometry, then we cannot go past the amazing mathematical experience offered by the software Geometry Expressions. This is a true (constraint-based) dynamic geometry environment with a CAS-engine under the hood. Construct your geometric figure quickly and easily, then constrain the side lengths to variables such as "a" and "b" - and then calculate the lengths of the other sides in symbolic form! This is a truly beautiful piece of technology - elegant to use, flawless in the quality of its output and effortless in the way that it takes geometric activity and translates this into symbolic form. Hardly an equal conversation, once again - dominated by the geometric representation, but able to converse with a range of available CAS packages. Presented with an intimidating symbolic result, this may be readily copied for use in Maxima, Mathematica, TI-Nspire or several other CAS packages, where it may be acted upon and the result brought back for further exploration. Once again, we see our bezier construction approached from a different angle: the geometric construction leads naturally to the algebraic form, which can then be mapped to a parabolic curve. Implicit or parametric forms? Both are readily available. If this package had a dedicated CAS window, it would be perfect! As it is, it is a taste of integration between CAS and DGS that is unique. In the end, we find that the most complete solution, offering the closest available option to what we seek, lies in the superb mathematical toolkit that is TI-Nspire CAS. 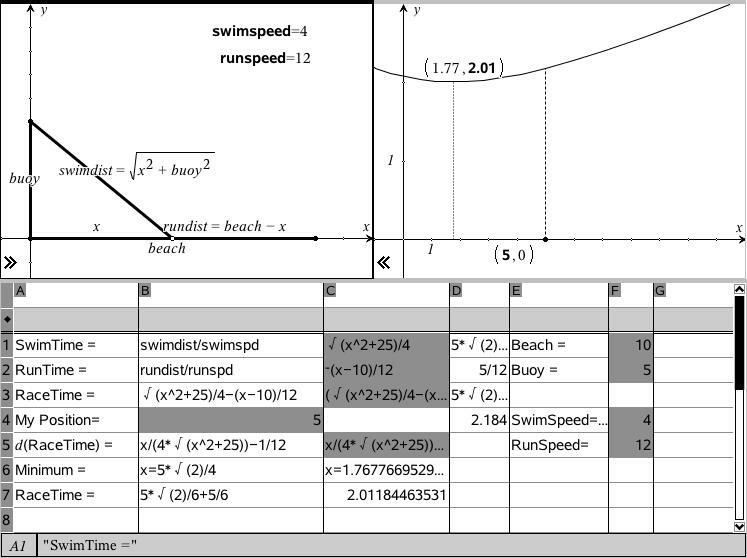 Dedicated computational environment, integrated graphing and geometry, symbolic spreadsheet, dynamic data representation - all glued together by dynamically linked variables. Functions and variables defined in one environment are available everywhere, giving us at last a taste of what we might expect from a true integration of CAS and dynamic geometry. Consider the example of the bezier curve, defined both algebraically and geometrically and able to be manipulated in both environments. THIS is our two-way conversation, true dynamically linked multiple representations which offer students insight and control over numeric, geometric and symbolic forms. The true secret ingredient here which makes it all work lies in the symbolic nature of the spreadsheet: a true CAS working environment which is dynamic! The case of the diminishing square offers another nice example. Here we see a variety of dynamic algebraic forms which respond to geometric changes in the model. The same representational flexibility is evident in explorations such as the Beach Race problem, shown below. Here the symbolic forms arise from the geometric model, but with the full power of computer algebra available for manipulation and exploration of the problem. The conversation is truly two-way, and both partners play their role in working together to offer a powerful and deeply meaningful learning experience.